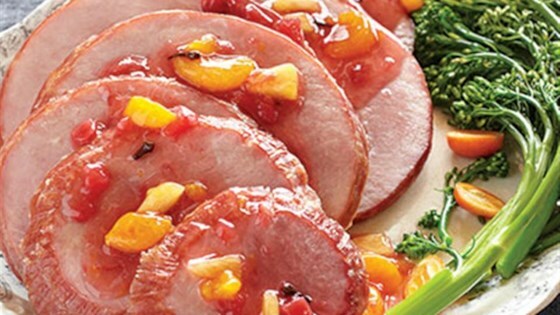 "Pineapple, mandarin orange sections, and a rich sweet and sour ham glaze perfectly complement thick slices of salty ham." Heat oven to 325 degrees F. Place ham slices in shallow baking pan. Roast until internal temperature reaches 140 degrees F.
Mix pineapple and oranges with ham glaze in medium microwave-safe bowl. Microwave on HIGH 2 minutes. Spoon half of glaze over top of ham; roast an additional 10 minutes. Place ham slices on serving platter. Serve with remaining warmed glaze.